When the morning broke on perhaps the only sunny day in February (if not the year) thus far, course set-up for Bolton’s home race of the 2014 Central Lancashire Grand Prix proceeded swimmingly…literally! The previous fortnight’s weather had left much of the minor trail terrain in muddy condition, with even a few tarmac areas exhibiting puddles that might otherwise be described as paddling pools! Still, with 20 minutes to spare and the course suitably decorated, nobody could have predicted the dark clouds on the horizon. As the race start beckoned, horizontal hailstones rained down. The freakish storm did not end there, as the opening minute’s hiccups included a couple of eager fallers, an unplanned addition of 20 metres to the racing line for some of the leaders, and a further 10m detour around a bus! Within 400m however, the usual pecking order was restored and a fast race ensued. 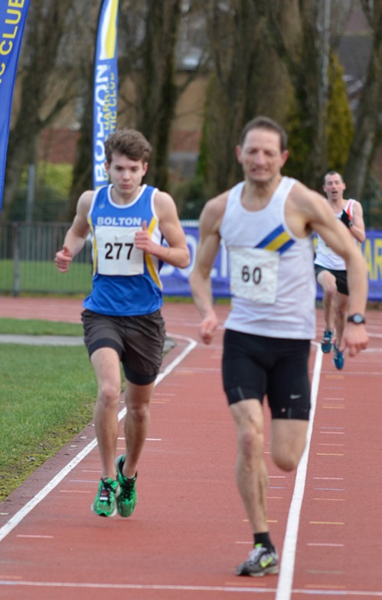 First for the blue vests of Bolton was Jonny Kay (16:49), who stepped up to the plate to lead BUH&AC’s challenge in the CLGP. 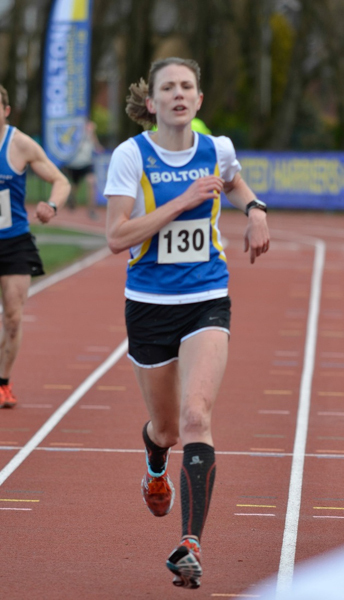 After steadily working back up through the field, Kay missed out on second position by a mere 2 seconds after a sprint finish with Trafford AC’s Michael Hunt, a CLGP non-counter. This came after Tom Carson, now competing in Horwich RMI colours, had cantered to a worthy win by over half a minute (16:01). 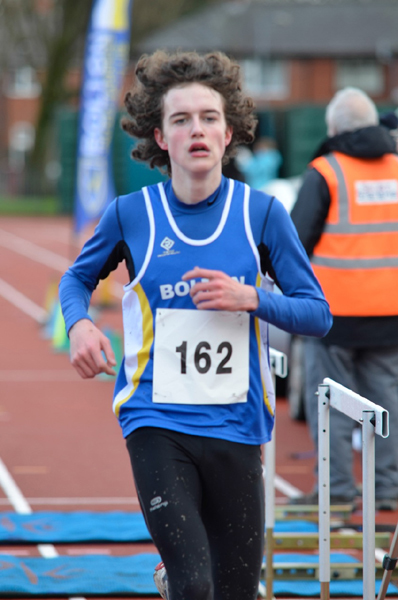 Frazer Jardine’s ambitions for the season also got off to a good start with a sub-17 minutes time for sixth position, with teammate Martin Reid 5 seconds behind in seventh – comfortably giving BUH&AC the Men’s Team win (16 points to Leigh’s 36). For a home race, an incredible nine of the first 18 finishers were Bolton athletes, three of whom were under-20 athletes (satisfyingly indicating a good future for the club). Perhaps the performance of the day came from 16-years-old Declan Toomey, making his first senior race appearance and finishing in 17th. That Phil Marsden’s 26thposition was the tenth and final counter for the CLGP A Team rankings showed Bolton’s strength in depth and gave them a fantastic start to the series (113 points to Leigh’s 232). The CLGP B Team, which comprises competing clubs’ next 8 runners (i.e. positions 11-18), was led home by Simon Dally (18:21) and included the perennially injured Dave Shaw and the ever-improving, PB-smashing Dave Hanson as final counter. With a collective score of 318 being less than the A-team third-placed Swinton (432), Bolton’s intentions for 2014 are clear. Also amongst the B team was Cath O’Dwyer, who recovered superbly from a startline fall to claim second (18:32) in the women’s race behind Leigh’s winner Dionne Allen (18:01) – it will surely be closer in the next race. Second race team counter Sarah Saxon (17th) was immediately followed home by promising junior Katie Oakley, placing the team just 2 points off Astley & Tyldesley’s silver (35 points). The good news continued with the Veterans’ team, spearheaded by Mark Swannell, taking an early CLGP series lead. The Bolton squad comprised a record 49 of the 285 field, and included debutants Anthony Warham, Oliver Radford, Andrew Barrow, Stuart Parsonon and Adrienne Fisher. 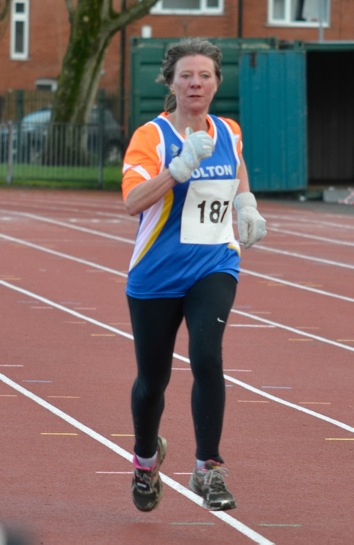 Amongst the multiple Personal Bests recorded by BUH&AC runners was Jane Lim, whose 25:57 was four minutes faster than last year’s time and epitomised the improvements with training over 12 months. Congratulations to all finishers and long may it continue. Let’s keep the momentum up and challenge in all categories for the next CLGP race – the Trotters 5M. A very special thank you to all the volunteers that helped to make the race another enjoyable and certainly memorable event! Without your assistance, these races would not be possible.